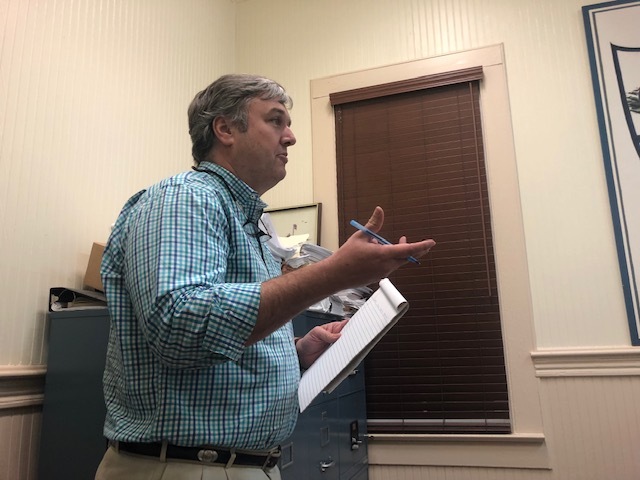 Ken Clark, with the NC Department of Transportation (NC DOT), met with the Clarkton Town Board on Tuesday night to discuss options regarding NC 211 and US 701 which pass through the town. The town board is exploring options to make the NC 211 and US 701 intersection safer and also consider changing NC 211 into a three lane through the town. Clark said that NC 211 is scheduled to be resurfaced in the year 2025. He suggested NC 211 changed to a three lane, to be configured with two traffic lanes and one turning lane in the center. Clark also said another option is to pave the three lanes in equal widths, or NC DOT can add a bike path to the design. 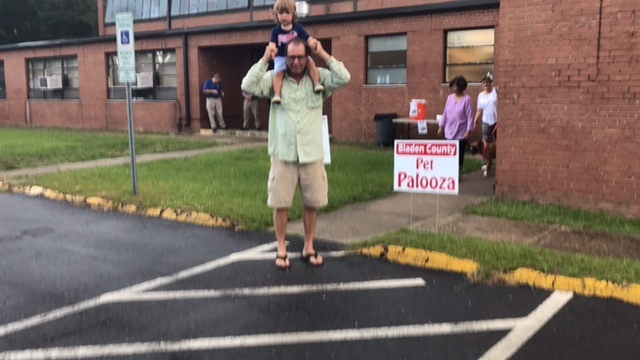 “If you want to move forward on 3-laning (NC 211) I can pull that section out (of the proposed resurfacing in 2025) and do it sooner,” said Clark. He told the board NC DOT would need a resolution of support for the project from the town board. Clark also talked with the board about the possible construction of a round-about at the NC 211 and US 701 intersection. The US 701 and NC 211 interchange in Clarkton. “I have Traffic Safety looking at the number of accidents there,” said Clark. 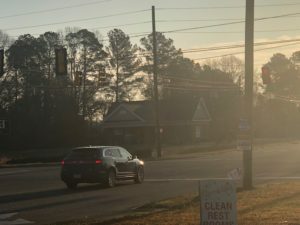 He explained if the intersection has a higher than normal accident rate, then NC DOT can explore the possibility of constructing a round-about. 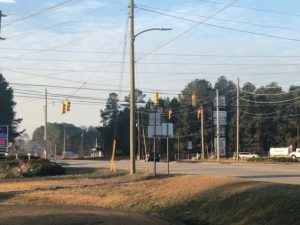 Clark said that in checking on NC DOT’s records concerning the intersection, the right-of-way was already acquired in the past. One possible issue with the round about construction will be the fact that both NC 211 and US 701 are multi-lane highways. Clark said NC DOT will study the design once they receive the accident information. NC 211 and the US 701 interchange in the early morning sun. “The safety aspect (of a round-about) cannot be disputed,” said Clark. Town Commissioner Stephen Hester asked about the traffic study. Clark stated NC DOT will be looking at accident reports and not actually counting the number of cars that pass through the intersection. “We look at the number of traffic accidents and the time of day (they occur),” said Clark. The board also asked Clark to address potential funding sources. He explained to the board the striping for the lane changes on NC 211 can be done when the road is resurfaced. The cost of the striping would be included in the construction costs. Clark said a round-about would have to compete for funding with other State road projects. Neither project would incur a cost to the town. *The board voted to name Public Works Director Chris Hall as the town’s Code Enforcement Officer. *The board voted unanimously to approve a contract with Withers and Ravenel for the preparation of the town’s 2019 NPDES permit renewal. 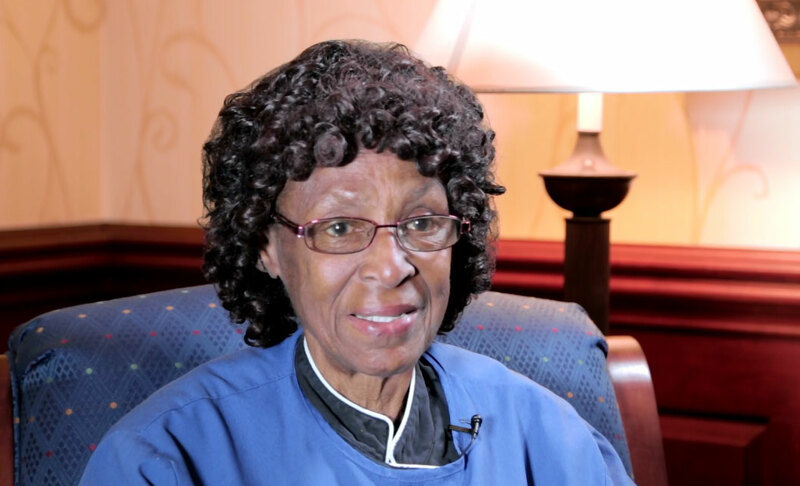 *The board authorized Town Attorney Cliff Hester to file a response to a foreclosure notice from the county regarding a property owned by Edna Packer. Hester told the board the property is being foreclosed on by the county for back taxes. *The board discussed the issue of smoking in the Clarkton Depot building. It was decided to designate an area at the end of building in the gravel area for the purposes of smoking. No smoking signs will be ordered. *The board discussed the utility account for Jamie Smith. Public Works Director Chris Hall said there is gate on the property and town staff cannot gain access to turn off the water. Smith is behind on his water bill payments. The board instructed Town Clerk Kentrina Woods to give Smith until Friday to make a payment on the past due amount. If he fails to do so, the board authorized Hall to request a Deputy to accompany him to shut off the water.